Here is what to expect when starting TMS therapy. TMS Therapy is a standard out-patient procedure done right in our clinic. The treatment is administered 5 days a week, over the course of approximately 6-8 weeks. The typical prescription is for 36 total treatments – 30 treatments administered five days a week for 6 weeks and then 6 remaining treatments spread out over what is called the “taper period.” The treatment takes approximately 30 minutes for each session. For each session, patients will remain awake while sitting in the TMS therapy chair. The chair is a similar shape to a dentist’s chair. At your first treatment session, the TMS technician will take time to adjust the chair so that you are comfortable. Your chair will be in the same position at each visit thereafter. You will remain awake during the treatment and are able to talk to the clinician, read, or listen to music. 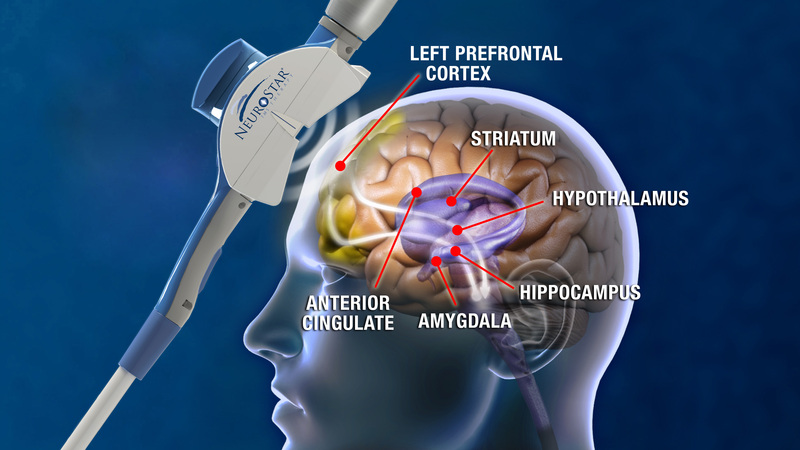 At each session, the TMS treatment coil is gently placed on the head, over the left prefrontal cortex. When the treatment begins, the coil will emit highly concentrated magnetic pulses, stimulating the area of the brain that is underactive in patients with depression. The pulses are delivered at a rate of 10 pulses/second for 4 seconds, followed by a 26 second rest period. You will receive a total of 3,000 pulses over the course of each session. Because the rapid pulses make a loud ticking noise, you will be asked to wear earplugs during the treatment. The treatment is administered by a trained TMS technician, under the supervision of Dr. Yoho. The technician will be in the room with you during the entire session. Should you feel like you need to stop the treatment in the middle of a session, the technician is able to do so. I am currently 44 years old and have suffered from depression since elementary school. I spent the majority of my older kids’ early childhood in bed, in the dark. Through past attempts to feel joy and experience life, I have been on several different meds. Some didn’t work at all. Some had very unpleasant side effects. Some made me feel better initially, then the dose had to be increased. Repeat. I decided to give TMS treatment a try because what did I have to lose? I was in a dark, dark place during my initial visit with Dr. Yoho. All I wanted to do was sleep. However, my three children and associated parental obligations prevented me from indulging my depression in this manner. Every day was a struggle. My depression manifested in fatigue, anger, irritability, moodiness, you name it. Ultimately, I decided to visit Emerald Psychiatry because my depression was becoming highly detrimental to my family. Initially, I was concerned about side effects. Could TMS cause permanent brain damage? Could TMS change my personality? Could TMS render me a vegetable? Is the risk worth the reward? Prior to beginning treatment, I researched TMS via NIMH (National Institute of Mental Health) and PubMed. The research, which indicated little to no side effects and a high percentage of positive outcomes, validated my decision to move forward. TMS therapy did not bother me at all. I would just close my eyes and picture each little pulse to be a beam of light/happiness absorbing into my brain. Somewhere around the 4th week of therapy, I began to notice that I was feeling better. I had no desire to lay in bed; I was not quick to anger. I enjoyed interacting with my kids and husband, and I became much more patient with people and situations in general. Any thoughts of not wanting to exist had completely disappeared. It seemed like I had become “excited about life” for the first time in memory. I would absolutely recommend TMS to relatives or friends experiencing depression to the degree that I was. I feel so much better. I have my life back, I can experience joy. I am a better mom and wife and friend (I’m in the process of organizing a girls’ trip, which I never would have done). Honest, compassionate and professional. Read about how other patients have experienced success with TMS therapy.